Two-stage furnaces have two operating levels. The first is very efficient and can heat your home on mild to moderately cold days. When the days get colder, the second stage kicks on to bring your home up to a comfortable heating level. Running both stages takes more energy, but the second stage is usually only needed about 25% of the time. When the first stage is the only one running, your heater runs at only about 65% of its full capacity. This means that your furnace releases fewer CO2 emissions. Because two-stage furnaces do not run at full capacity all the time, they tend to be fairly quiet. 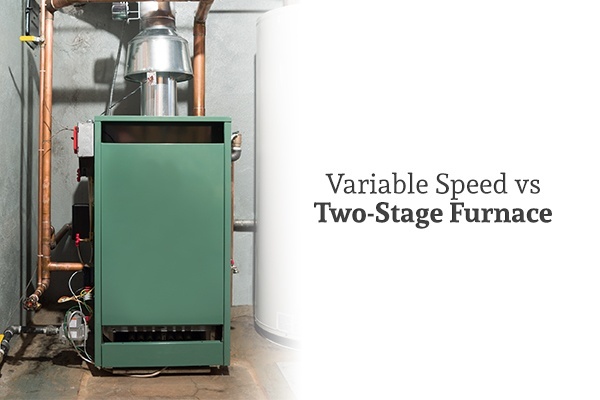 Variable speed furnaces are named for the blower motor inside the furnace. These furnaces can run at different speeds as needed to give you a precise level of comfort. Because of this responsiveness, they work very well with smart thermostats. The better airflow also provides you with more balanced temperatures and can reduce the humidity in your home. A variable speed furnace tends to have a high initial cost, but this investment will pay itself off over time. First of all, variable speed furnaces are incredibly energy-efficient. Secondly, they require little maintenance. Another benefit of variable speed furnaces is the impact on indoor air quality. The motor on variable speed furnaces can continue running even when the system isn’t pulling in heat. This circulates the air in your home to help flush dust and other particulates out of your air ducts. With much of this dust pushed out of your home, your indoor air quality is vastly improved. Variable speed furnaces turn on slowly, so you’ll never be bothered by that loud kicking on of the system. A third option is a single-stage furnace. This type is not recommended since two-stage and variable speed furnaces are both much better. Single-stage furnaces are not as energy-efficient, release more CO2, and tend to be louder than the other kinds of furnaces. These furnaces are essentially either “on” or “off,” with no stage in between. Because of this, they don’t have as good temperature control and are very inefficient. If you’re looking to get a new furnace installed in your home, contact Cote’s Mechanical. Their technicians are experienced at installing every kind of furnace and can help you choose the type of furnace that will best suit your needs.